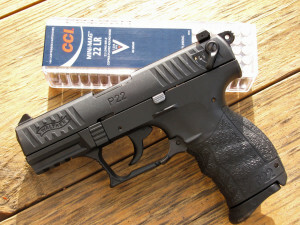 The Walther P22 that I am reviewing was the first gun I ever shot and what a magnificent choice it was as my first gun. I have always had a thing for the way the P22Â aestheticsÂ – it looks like a semi-autoÂ combat handgun and not an alien blaster (I canâ€™t say the same about the Beretta Neos). Even some Ruger 22/45s have an acquired taste, but if you dig the modern looking handgun the P22 is the clear front runner. But the P22 isn’t just a pretty face. You can tell that the P22 is a quality firearm as soon as you pick it up. Everything feels like it is supposed to and nothing rattles or seems like it’s about to fall off. The gun is very simple to use, but it does come with a manual safety that is opposite of the 1911 convention. That is, on the P22, down means safe, and up means fire. One thing that could be new for some people is the mag release. The P22 has a European style mag release, where the mag release is a lever on the bottom of the trigger guard. It may take some getting used to for people accustomed to the American style push-button release. One thing that is immediately noticeable on the P22 is how light it is, coming in at just 15 oz. A lot of people think the lighter the better, but for me the P22 can almost be too light. Sometimes when shooting, my hands start to wobble in the air which affects my accuracy, but for my intended use the weight is fine. I find it to also be a very ergonomic handgun. For some folks it might be a little too small, but it comes with interchangeable back straps so you can put on the size that best fits you. The P22 trigger is nothing special in single-action pulling just over 5 pounds, and itâ€™s a little rough in double-action pulling 12 pounds. The trigger most likely will not be an issue if you intend to use the gun for practice, but for self-defense it could be for some. Having said that, I think most people would agree that a .22 LR isnâ€™t the best option for self-defense in the first place. The P22 has a few aftermarket accessories such as a barrel extension which makes the barrel 5â€ long instead of the standard 3.4â€. You can also buy a laser made by Walther to go on it for around $100. The P22 also comes in a multitude of camouflage frames from Pink digital to lime green. I have found the P22 to be fairly accurate. I can usually keep about a 2 inch group standing at 6 yards, although sometimes the light weight does make me wobble a few shots. You can expect to be fairly accurate with this gun, but donâ€™t expect it to be a total nail driver offhand because of the short sight radius. If you are going for ultimate accuracy, you are better off buying a Ruger 22/45 hunter which has a much longer sight radius. With the 22/445 I have no problem shooting one hole groups at 6 yards. My favorite use for the P22 is as a training and practice pistol. Because of the practicality the .22 LR round, the P22 serves its purpose very well and allows me to practice a lot more than I would if I was just shooting centerfire rounds. I do not feel bad or bankrupt after blowing through a couple hundred rounds of .22 LR, but I cannot say the same if I was shooting something else like .45 ACP. My least favorite part about the Walther P22 is how picky it is about ammo. I always shoot CCI Mini-Mags ammunition through it because everything else I’ve tried causes it to malfunction. So rather than buying a 550 round box of Federal Bulk ammo for $20, I have to pay $7 for 100 rounds of CCI. Granted itâ€™s not expensive compared to other calibers, but I would still prefer to just buy Federal Bulk. But if you shoot CCI Mini-Mags through it youÂ shouldn’tÂ have any issues, the only malfunction I have ever had with CCI were a few failures to feed. All were from the same box of ammo and they seemed to have some sort of gel on the tip of the bullet (maybe a bad batch). I have put well over 2000 rounds through my P22 and other than those few issues it keeps on running and will chow down on CCI all day long. The P22 is a wonderful little pistol, but itâ€™s not the only game in town. 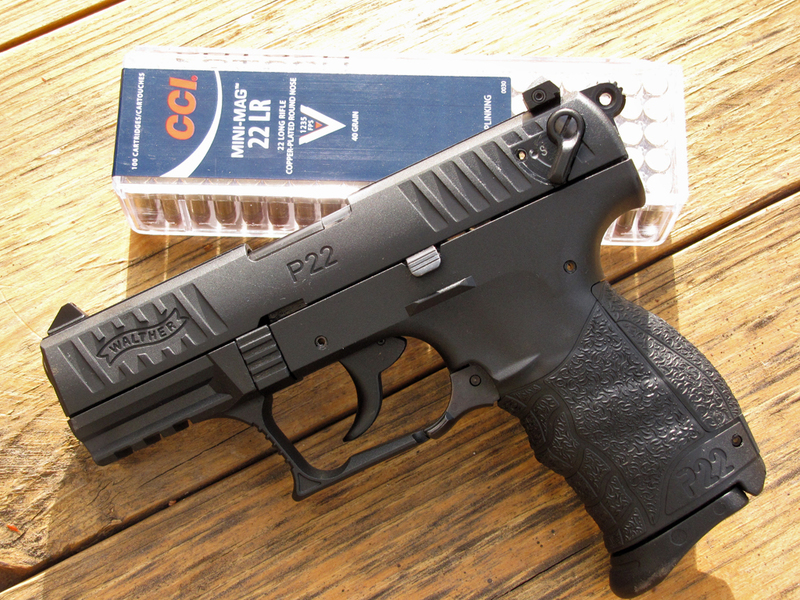 Ruger recently came out with the SR22, which is almost identical to the Walther P22 with perhaps better reliability. Check out this review by Ebbs from Haus of Guns. Overall, I would definitely recommend the P22 to anyone looking for a good .22 LR pistol, whether you want to plink or train, I think it will serve your needs. Nate is relatively new to the world of guns and gear but has a real passion to pursue it. He wants to learn as much as possible and help others get interested in the firearms community. For most folks, “European style mag release” means a catch on the heel of the stock. The Walther P22’s mag release is unique to Walthers (I think). See HK. Not identical but very similar. Great review, I own a Walther P99 it was my first hand gun which is almost identical I believe to the P22. Regarding the European mag release lever I have found that if you aren’t used to it or if you are a beginner you may be accidentally pressing it when you shoot, therefore releasing the mag. I’ve done it maybe once and I believe it was due to the bulk of my Oakley Hardshells gloves. I bought the Ruger SR22 for no other reason than it’s supposed to run bulk .22 ammo. It does and does it well. Have you shot the PK380? Or do you have a recommendation of a good review out there? Thanks.